The virulently anti-Semitic “Protocols of the Elders of Zion” is now available in virtual form as an application in both the Apple iTunes and Android marketplaces, according to a report by Middle East Media Research Institute (MEMRI). For just 99 cents iPhone users can download the Protocols from the “Education” section of Apple’s online marketplace. A portion of the profits from the application’s sale ostensibly go to Apple, as developers engage in a 70-30 split of revenue with the computing giant, according to Apple’s guidelines and the MEMRI report. 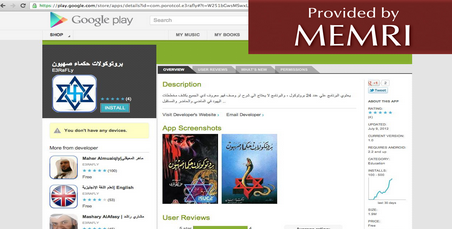 The application is also available on Android smartphones at no cost, MEMRI reports. The sale of the ancient, anti-Semitic tome has drawn ire from several Jewish organizations that have urged the computing giants to ban the applications. Both Apple and Google, which produces the Android platform, have remained mum thus far, refusing to take action. The Protocols of the Elders of Zion is a decades-old book purporting to reveal the ways in which Jewish people control the international monetary system, as well as politics and foreign policy. Though it has been widely discredited in most of the Western world, the anti-Semitic book is still heavily circulated throughout the Middle East and Arab countries. One Android version of the Protocols, which includes images of swastikas, has been downloaded by users “between 500-1,000” times, according to the report. Another English version of the application that can be accessed from Google Play via an Android smartphone is currently on sale for one dollar.